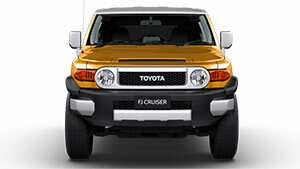 The FJ Cruiser’s design is legendary, melding tradition with modern technology and practicality. See how all elements combine to make it a truly inspired 4WD. Make no mistake; the FJ Cruiser has serious road presence. The iconic white roof (except the Red Fury colour), round halogen headlamps and wrap-around rear quarter windows and over fenders pay homage to the classic FJ40. Privacy glass covers the rear side, quarter and back windows. The back of the vehicle also features rear fog lamps; rear access doors and a glass hatch rear window. For practical purposes, the inside features water-repellent seats facings; a large cargo area with tie-down points; and padded armrests on the front seats for maximum comfort. FJ Cruiser owners belong to a special class. Sharing an enthusiasm for four wheel driving, they also share the unbeatable benefits of owning a Toyota. 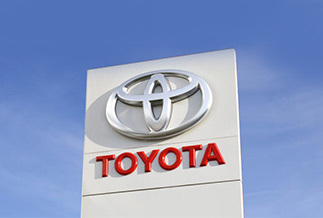 As an owner, you are entitled to Toyota Service Advantage, which offers low cost, capped priced servicing [T1]. You also have Toyota Finance Advantage at your service. We can help you find the right loan at a competitive rate. 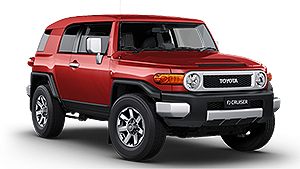 Toyota’s new vehicle warranty means you can count on your FJ Cruiser to go the distance. Long ago, a 4WD legend was created, and now technology is driving that legend into the future. 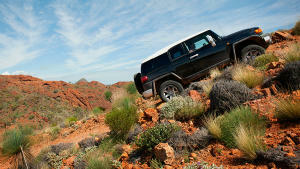 The FJ Cruiser uses technology to ensure an enhanced 4WD and on-road driving experience. All the controls you need are at your fingertips with the steering wheel audio and Bluetooth™ controls and Multi Information Display, which includes a compass and inclinometer for all your off road adventures. 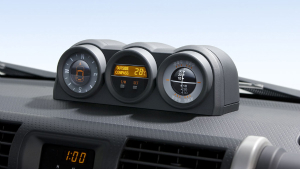 The on-board Satellite Navigation system [N1] [F1] simply add to FJ Cruiser’s premium character. A Reversing Camera [B4] and rear parking sensors [B4] allow you to back up and see what’s behind you with ease while the audio system with ceiling speakers makes for an exceptional sound experience. Safety is paramount no matter where the road takes you. 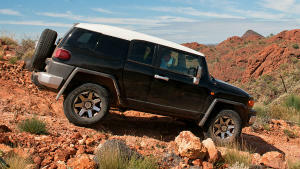 The FJ Cruiser is built to maximise protection in all kinds of driving environments. Vehicle Stability Control (VSC) and Traction Control (TRC) help you hold your path in difficult driving conditions. 5-speed CRAWL Control [B10] helps you maintain even progress over slippery and uneven surfaces, off-road, taking care of throttle and brakes to keep you at your set speed, so you can just concentrate on steering. The advanced braking system includes Anti-lock Braking System (ABS), Electronic Brake-force Distribution (EBD) and Brake Assist (BA). The Reversing Camera [B4] aids in seeing what’s behind you when reversing. To protect you from would be car thieves, the FJ Cruiser also features an engine immobiliser so only the key holder can start the vehicle. A 4WD is nothing without performance, and the FJ Cruiser includes a host of technologies for optimum performance in all environments. 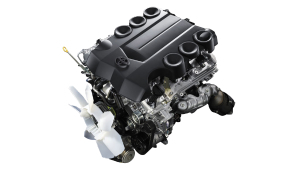 Starting with the engine, the FJ Cruiser utilises the same 4.0L, six-cylinder engine as the Prado.Dual VVT-i technology provides power and efficiency. The Part Time 4WD system allows you to switch to a more fuel-efficient mode when you’re not off road. You can also switch on Cruise Control for more effortless driving. When you are off the beaten track, you can rely on Active Traction Control (A-TRC) , 5-speed Crawl Control [B10] , Electronic Brake-force Distribution (EBD) , Vehicle Stability Control (VSC) , a rear differential lock, heavy duty suspension and an impressive ground clearance. No lightweight, the FJ Cruiser has a braked towing capacity of 2,250kg [G6] so you can haul all the gear you need for your excursion. From the seats to the wheels to the undercarriage components, the FJ Cruiser has been fully designed for off road driving. Its dimensions support a wide, muscular stance, similar to the original FJ40. The generous approach and departure angles [N6] allow you to climb and descend steep obstacles while the 224mm of ground clearance [N6] means you can explore further without damage to the underside of the vehicle. Large wheel articulation assists in navigating through uneven ground and the specially placed air intake helps you to cross through water. When you need to manoeuvre over tricky terrain, you can activate CRAWL Control [B10] which automatically controls the throttle and brakes to keep you at an even speed, so you can concentrate on steering. 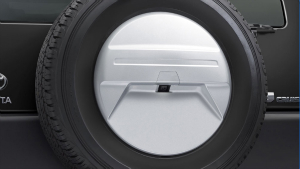 For all the bumpiness that comes with off-roading, assist grips on the back of the front seats help passengers stay steady and make getting in and out easier. [B10] Crawl Control is a driver assist technology and should not be used as a substitute for safe driving practices. The area into which the vehicle is to be driven must be visually monitored by the driver. [N6] Some vehicle dimension figures are approximate and may vary due to option, accessory fitment and weight carried.